The National Transportation Safety Board began its investigation yesterday into the crash of a Hawaii Air Ambulance airplane that killed a pilot and two medical personnel. 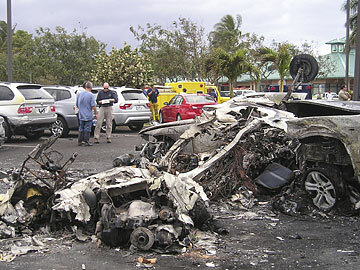 Here, investigator Van McKenny examines the crash site at BMW of Maui. WAILUKU » The Hawaii Air Ambulance pilot involved in Wednesday night's fatal plane crash was involved in another crash last year at Honolulu Airport in which the plane was substantially damaged. Peter A. Miller was already employed by Hawaii Air Ambulance when he took a student pilot out on a flight July 1 to practice a shutdown of the left engine. The National Transportation Safety Board's preliminary report in the 2005 case said when the left engine could not be restarted, Miller decided to return to the departure airport. "During the approach to landing, the pilot elected not to use the Emergency Gear Extender because he did not feel comfortable having the (student) fly the airplane single engine while he applied the Emergency Gear Extender control," the NTSB report said. Upon landing, the landing gear collapsed, the plane veered left and four feet of the left wing was sheared off when it hit a taxiway light, the report said. The twin-engine plane sustained substantial damage, but neither Miller, a certified flight instructor, nor his student was injured, the report said. After reading the report last night, Steve Henley, Hawaii Air Ambulance's director operations, said, "Looks like he made a judgment call not to do it, and everybody survived, and that's the main thing." Henley said that the company was aware of the accident, but "everything came up flying colors" when a Federal Aviation Administration investigator flew with Miller to check his proficiency after the accident. "He was a good pilot from the beginning," Henley said, calling the July 1 accident "an unfortunate occurrence." Miller attributed the accident to a problem with the airplane, Henley said. Meanwhile, the National Transportation Safety Board began its investigation yesterday into the cause of the Wednesday crash that killed Miller and two other Hawaii residents who were on a medical mission to Maui. Part of the probe will involve an examination of the Cessna 414A engine, said NTSB investigator Van McKenny, who will be working with a technical representative from Cessna and Teledyne/Continental Motors along with FAA officials in gathering evidence. McKenny said he is gathering various pieces of information, including radar, audio, voice communications tapes and apparently some TV news video. But he does not know the flight path of the aircraft as it neared Kahului Airport. The airplane left Honolulu at about 6:30 p.m. Wednesday for a patient pickup on the Valley Isle. Maui police received a call at 7:17 p.m. about the crash in the BMW of Maui parking lot, authorities said. As a matter of precaution, Hawaii Air Ambulance grounded its remaining aircraft for maintenance checks yesterday and today but scheduled to continue to service patients by having its medical staff fly on other planes, including those of the U.S. Coast Guard and other private aircraft, said company CEO Andrew Kluger. The patient, who was to have been picked up Wednesday and was in intensive care, was one of three flown to Honolulu from Kahului yesterday afternoon by the Coast Guard, Maui Memorial Medical Center spokeswoman Carol Clark said. The aircraft was bought to replace a Hawaii Air Ambulance Cessna that crashed on the Big Island and killed three people on Jan. 31, 2004. "It was the newest aircraft we had acquired. The aircraft had low mileage and it was in good shape," Kluger said. "It was not new, but it was good condition, barely used." According to findings by the NTSB, the Hawaii Air Ambulance Cessna, which crashed near Laupahoehoe, showed no engine trouble upon inspection. NTSB inspectors also noted that the pilot was properly certified and appeared to have nothing medically wrong with him, although there might have been a chance of "moderate turbulence" that day. "It's not mechanical, not pilot error; it was nothing they could determine other than an act of God," Kluger said. Prior to the crash, Hawaii Air Ambulance maintained five twin-engine fixed-wing Cessna 414A aircraft based in Honolulu and on Maui and the Big Island. The planes were in operation seven days a week, 24 hours a day, with the company rotating four in the air while one underwent regular maintenance. According to company officials, all pilots are required to pass flight checks every six months and have a minimum of 2,500 hours of flight time. McKenny said the aircraft was not required to carry a flight data recorder because it carried a limited number of passengers. As part of standard air crash procedure on the Valley Isle, the remains of the three victims were taken yesterday to Maui Memorial Medical Center for an autopsy, including toxicology tests for alcohol and drugs. Maui businessman Joe Hommel said the airplane brushed the tops of coconut trees and passed about 25 to 50 feet above his vehicle traveling on Hana Highway toward Kahului Harbor. "I could actually feel the breeze from the props," Hommel said. Hommel, who has done some student flying, said both engines were operating but sounded "stressed and choked." He said the pilot had no control over the airplane as it dived at a speed of about 150 to 200 mph into the BMW of Maui parking lot. "It was like a meteorite," Hommel said. Star-Bulletin reporter Rod Antone contributed to this report.